Our comfortable family vacation home is situated on the stunning gated community of Emerald Island. This is a well kept, private community located just off Highway 129/Int.4. The rear of the property overlooks a lake and wetlands and to the front, is ample parking and manicured lush surroundings. Plenty of free wildlife to spot! 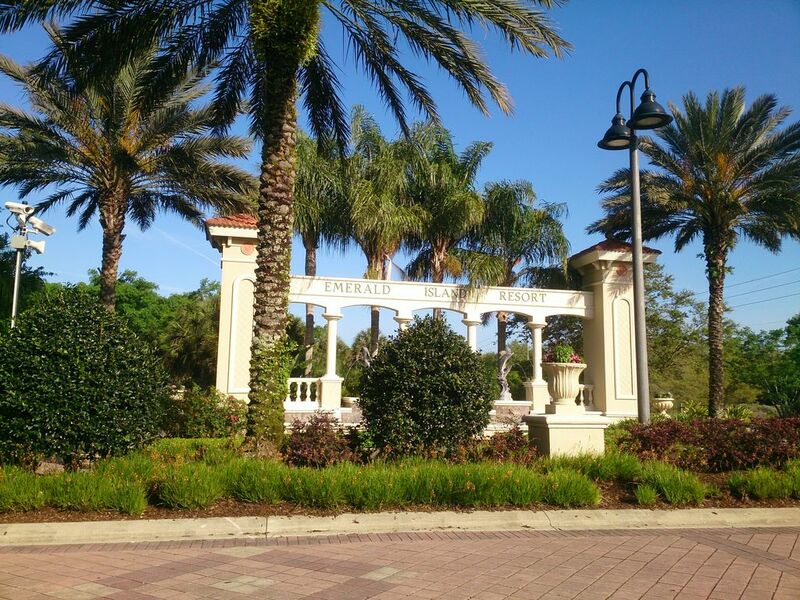 Emerald Island is situated very close to Disney (3 miles) and a short drive from shopping and dining. Emerald Island is one of the nearest rental vacation communities to Disney World Resort and we mean that. Who wants to spend their vacation sitting in the car, not our guests! Our home has free baby facilities FREE WiFi, FREE telephone calls (UK, France, Spain, Ireland land line calls and FREE US calling) and lots more. We aim to offer clean, modern, comfortable accommodation for families on a reasonable budget. We do not think you will be disappointed. Amenities: Our property backs onto a large pond/conservation area and is un-overlooked. There is a small patio to the rear of our house, with seating and a charcoal BBQ. Off the Master bedroom is a balcony which also overlooks the lake to the rear of our home. Sit and watch the early morning hot air balloons float past and watch the wildlife! All towels and linens are provided (including pool towels). We have free US/Canada/Puerto Rico telephone calls from our home as well as free international calling to landlines only in UK, France, Spain & Ireland. Free Internet connection (WiFI) available for use at our home so bring your laptops and PC's are available for use at the clubhouse. We also have cable tv in all bedrooms and the living room, including HBO and Disney channels. Our home is looked after by fantastic housekeepers who keep our house spotless and in great decorative condition. You will not be disappointed!! A perfect base for a special family vacation at an affordable price after those busy days at theme parks. Room enough for a family to have their own space, unlike staying in a hotel room together. We are a family of 4 from the UK who love America so much, we decided to buy a holiday home so we could visit every year. We feel lucky to have such a great place and are happy to share our home with other guests and families looking for a bit more space than a hotel room has to offer. Our home is clean, modern, in a great location, close to all the main attractions (who wants to spend all their time sitting in the traffic) and we feel it offers great value for money. Renting a home gives you more space to relax as well as additional facilities to staying in a hotel. Quiet, Well kept, Gated rental resort. Small lake to the rear of our home. Great for watching the wildlife. high speed free Wifi connection throughout the home and around communal areas on the resort. Small fitness room at the clubhouse free for all guests to use. Fully equipped kitchen whether you want to just make breakfast or cook a family dinner. PS3 games, nintendo gamecube games as well as several family boardgames. Balcony from the Master Bedroom overlooking the lake. tennis Courts at the resort for guests to use. My family and I had a very enjoyable time at this townhome. Had everything we needed. The location can't be beat! Excellent vacation rental, close to everything!! This condo was exactly as described, and in excellent condition. Close to the parks, route 192, golf courses, etc. the clubhouse pool and hot tub were outstanding, and my stay was perfect. I would recommend this rental to others, and would stay here again if the opportunity presented itself for future travel. Thanks, Jo!! My family stayed here for a week while visiting Universal. Upon arrival it was hot.. Lol. ... Something beyond the owner's control. The AC unit had stopped. The housekeeper Julie was prompt in responding as was Jo. ( Julie's husband even came to see if he could assist). The repair guy was quick and witty and after AC was restored it was great!! Neighborhood was very quiet and my son enjoyed the pond out back. Thanks for allowing us to use your condo and blessings to your family. Great place! Exactly as described. Clean, comfortable, and all the necessary amenities. Easy booking and responsive host. Would definitely stay again. Accurate description & clean property. It was really great staying at this property. As this was our first rental through Home Away, we were a little concerned about the accuracy of the description. We had exactly what was described and a good customer service from the beginning, besides we found a clean and in good condition house. We definitely recommend this property to a friend or relative. With so many places to pick from it was a hard choice. We would stay here again in a heart beat. It was perfect for our family. Owner & housekeeper are great. Townhome is large and Emerald Island is safe. We loved it. Golf: Close to all the major golf courses. Clubhouse can arrange special discount rates for Mystic Dunes as well as golf equipment hire and transportation to and from course. Champions Gate and Disney courses are nearby. Take your pick from over 100 courses! Rates are subject to change until reservation is confirmed. Discounts for stays over 7 nights may be available - please contact for details. For any stays of less than 7 nights, an additional cleaning fee of $85 will be payable. Guests pay a $200.00 refundable security deposit upon booking or take out damage protection insurance, if they prefer. The deposit payment will be due on booking and is refundable at the end of the rental, subject to the return of our house keys and an inventory check by our housekeeper for no major damage or loss to the home. Full rental payment to be made 5 weeks before date of arrival or in the case of last minute rentals, at the same time as the refundable security deposit.